What happens if we break one of our principles or give in to a craving? (I call it “having an excursion.”) It may happen at a fast-food outlet, during a weekend afternoon snack, or at a family celebration. In fact, it could happen anywhere and at any time. Of course, we have all the information we need in order to deal with challenging situations, but sometimes it is hard to access our own knowledge when we need it most. If you “let go” between meals, your body cannot tell the difference between a “large snack” and a meal. It will register your “slip-up” as a low-nutrition meal. That means you have added an extra meal that day. Also, some excursions are very high in calories and fat. Suggestion: If your excursion exceeded 300 calories, try to make the next meal a LIGHT MEAL, even if you already ate one that day or a majority veggie ONE CF MEAL, like a salad with a protein topping. If it was less than 300 calories but more than 120 calories, then stick to vegetables or fruits between meals for the remainder of the day. In other words, if you ate a chocolate and a small bag of chips for your mid-afternoon snack, it would be best to make dinner another LIGHT MEAL or a majority ONE CF meal if you want a larger meal. This excursion was probably greater than 300 calories. So if you ate a fruit meal for breakfast and a tuna wrap for lunch (V-PLUS meal), you would either eat another LIGHT MEAL for dinner—salad and soup, or egg and toast—or a ONE CF meal—salad with a chicken, feta, or tuna topping. If you ate only one chocolate as a snack, you would only eat vegetables or fruits until dinner and after dinner. This excursion is greater than 120 calories but less than 300 calories. In truth, having one or two “lapses” a week is built into the system. This does not mean that you should plan on having these excursions. You will experience quicker weight loss and accumulation of new healthier traces if you make fewer deviations from the principles. The above guidelines will help prevent ruining your balance of meals. But if you overdo it a third time in a week, you need to sit down and reaffirm your commitment to your goal. You cannot expect health, energy, and weight maintenance if you are going to eat without guidelines. Get back on track immediately. If things really start to get out of hand, “Turbo Phase” is an excellent way to reinstate your natural controls. It gives the quickest results and the most effective cleansing effect. In short, it will get you back on track quickly. It also allows you to achieve a “detox”-type experience without having to starve yourself. Take 1 capsule 30-60 minutes before CF Meal and 1 capsule before V-Plus meal. Continue taking the Stress Relief supplement as needed, 30-60 minutes before bedtime. If you want to implement a more extreme Turbo Phase, you could eat two LIGHT MEALS and a ONE CF MEAL. 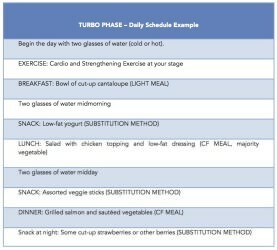 If going onto Turbo Phase is not effective and you continue eating badly, try the following steps: Continue the diet at your particular stage, but start keeping your Personal Ledger from the beginning of the program—Week 1. For example, if you were up to Week 5, continue eating a V-PLUS MEAL and applying the principles from the previous weeks, but start keeping track of the Personal Ledgers from the beginning with Week 1. This way, you can pay attention to the buildup of each principle from the beginning without having to actually start from the beginning. You are trying your best not to backtrack on a practical basis, but you are rebuilding subconsciously from the foundation up. Perhaps your new habits were not firmly established, and all you need is to build a stronger foundation. If this does not work, you may have to actually start again from the beginning of the program at Week 1. I have seen some people who went back to the beginning of the program two or three times before reaching their goal weight. This was necessary in order to break firmly entrenched habits and to set those new positive subconscious accumulations in place. It is normal to backtrack, so simply get back on track—without berating yourself. It is an expected part of the process of accumulating enough subconscious traces to overcome old habits. This is not just “motivational talk.” This is the way the mind works. The excerpt from Accounting of the Soul bears repeating: The sheer strength of “willpower” is inconsequential when compared to an intense desire…if there is a sudden confrontation between these two forces, willpower will be overcome easily. Nevertheless, the small impressions of willpower are not eliminated completely. Instead, they constantly leave traces that accumulate so that eventually the strength of willpower increases enough to overwhelm even the most intense desires. In other words, when we stumble, it may seem as if all is lost. However, each time this happens, small impressions of the effort we exerted to try and overcome that craving are made on the subconscious mind. Although we are not aware of these impressions, they are there. If we continue trying to overcome that bad craving, eventually all the traces of willpower accumulate into a force that is strong enough to overwhelm the craving. If we stay on track, we will succeed and conquer our old bad habits. We need persistence and patience, allowing enough time for the subconscious habit accumulation of traces.